I’ve spent the last five days at the Mosel, where I was lucky to taste 2012 Rieslings with some of my favorite producers, and new contacts. Most of these tastings were dedicated to the 2012 vintage, but it was hard not to talk about the 2013 harvest, which was just finished a few days or weeks ago, depending on the winery, so let me start with that. 2013 seems to have been a very difficult year: It started with low temperatures which led to late bud break and flowering, followed by a very dry summer. Some areas saw early summer hails that led to some areas remaining without any yield. Once harvest time came around, the weather started turning wet and rainy, which meant vintners and their staff had to time picking grapes quite well in order not to get grapes that were either too soaked with water or brought in a bunch of water. All in all, 2013 seems to have reinforced the need for a lot of work in the vineyards throughout the year (e.g. cutting down grape clusters very early once it was clear that the ripening period was shorter). What I tasted from the barrel showed quite some acidity (as was to be expected from a very mixed weather year), but aromas seemed to be alright. 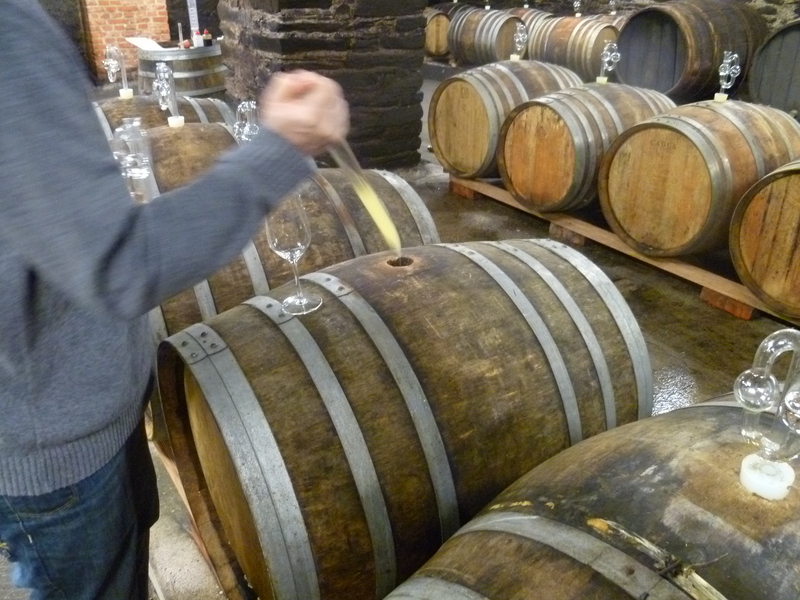 Most winemakers lamented how low their yield was, but that they were fine with the result in the barrels. This is the third in the last four years that brought significantly lower yields than on average, and it could mean financial difficulties for some….for now, a lot of the wines are still bubbling, and it is wait and see. 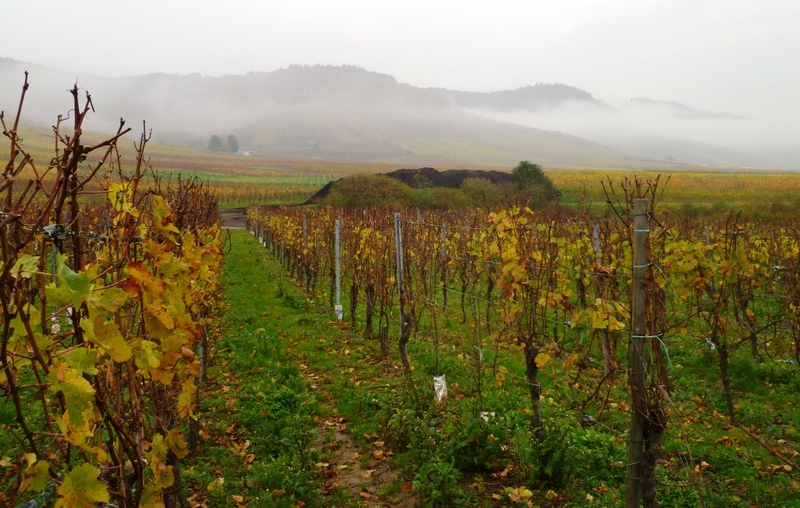 March 2012 was unusually warm at the Mosel, which led to an early bud break. Through uneven weather conditions in June, the yields fell quite a bit and there was early rot due to a rainy July. Other than that, conditions were normal. And a standard September weather brought a quick rise in sugar levels, maintaining higher acidity levels as well. The October had cool nights which made the acidity remain rather high and grapes remained mostly clean with low levels of botrytis. All in all a rather good year, with the problems of low yields arising from June and July. In retrospect, and having tried more 2011s, I think I am really struggling more than I realized back then with their low acidity. Which was good for the dry Rieslings, but made the fruity and sweeter styles more difficult. The 2012, in contrast, cannot complain about too little acidity. The wines all showed a nice balance of healthy acidity and enough sweetness. They were light and elegant, and refreshing. I probably benefited from trying them longer after their bottling than the 2011s, but it seemed to me that these wines were more to my liking. The interplay between sweetness, fruitiness and acidity is such an important part in a Riesling. And it seemed to work in most. I also tried a bunch of 2012 dry Rieslings. I do think I still prefer the subtler style of 2011 over the stronger acidity-determined 2012s, but I found many of them surprisingly good. My range of assessing vintages is still very limited, so I cannot really compare or give advice on where this vintage lies (and, I also realize more and more that there are no good or bad vintages, it is more easier or harder vintages for the winemakers….or as a winemaker put it: There are no bad years, just bad winemakers.). Pick up some champagne with your wine. I wrote this piece a while back but never published it…it is still a good summer story. It is about time I write about a Riesling again, especially before I go on my summer break…and the time for a wonderful wine came after our Napa Cabernet Sauvignon vertical. The 2011 Weiser-Künstler Enkircher Ellergrub Riesling Kabinett showed itself in a very pale, light color, it looked almost as clear as water. That was surprising, I didn’t remember it that way. In the nose, spontaneous fermentation was still very prominent, followed by peach aromas. On the palate, this medium bodied wine seemed very ripe, with aromas of peach, pear and some cream. There was a rather low acidity this time around, still noticeable, but definitely less prominent than my previous note suggested. The wine had a rather short finish. A bit into the tasting, I started getting some strawberry aromas. I liked this wine a lot. It has a sophistication to it that is very pleasant. It is not a deep wine, but it changes enough in the glass to keep surprising you again and again. In a more subdued state right now, less refreshing than in 2012. You have read about me drinking Dr. Loosen wines before. I also indicated before that I never drank much of their wines while in Germany, for whatever reasons. But given Dr. Loosen’s prominence in the U.S. and Ernst Loosen’s tireless promotion of Riesling over here, I am finding more and more Loosen wines and try them here. When we went to a wine store and I saw this bottle, we decided to grab it. 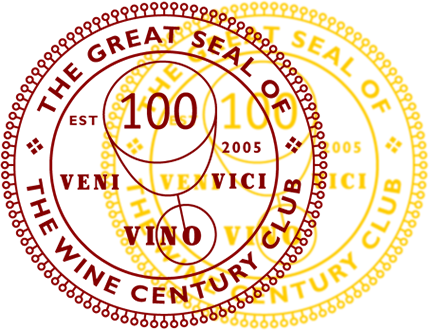 I am very fond of the crazy 2010 vintage, and I had heard about this particular wine before. Let me give you some background on the winery: Dr. Loosen is currently owned by Ernst (or Ernie) Loosen. The estate has been family owned for over 200 years. The winery has been a member of the elite winemaker association VDP since 1992 and it owns plots in most of the Mosel’s prestigious vineyards. It is one of the larger estates along the Mosel. This particular wine is a non-single vineyard Kabinett wine, in the German system the lowest level of quality wine with distinction (if you are not familiar with these denominations, please check out my quick guide here). 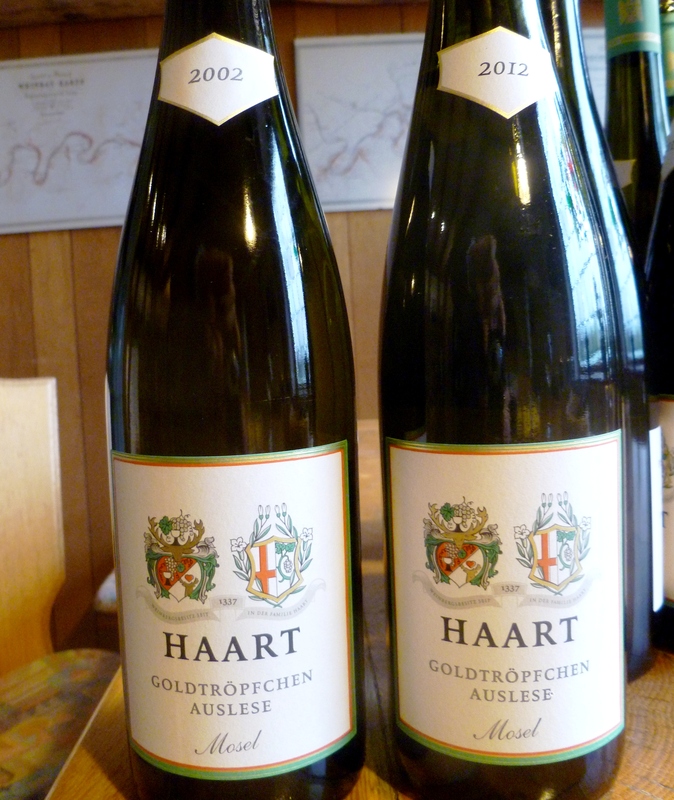 The winery describes its aim for this wine as producing a light, typical Kabinett style wine. The grapes were sourced from blue slate vineyard sites in Bernkastel, Graach and Wehlen and the wine has 7.5% ABV. You can check out the winery’s description of the wine here. A greenish yellow in the glass. On the nose subdued aromas of citrus and yellow fruit. On the palate, I got less acidity than I expected (it’s a 2010 after all! ), with citrus aromas (grapefruit and tangerine mostly), some melon and early signs of ageing. The noticeable residual sugar gave the wine a medium long finish. The wine seemed a bit thin, though (for lack of other words). All in all, this was a refreshing summer wine, but it was also a bit disappointing: I had definitely expected more minerality and hoped for a stronger expression of flavors. It did pair alright with the Asian food we were having. Given that we bought it on sale for $15 (it seems to retail for $20 and up) I am not sure the quality to price ratio is right for this wine. Also, keep in mind that for that money you can usually get at least a single vineyard bottle of Kabinett from other established wineries. 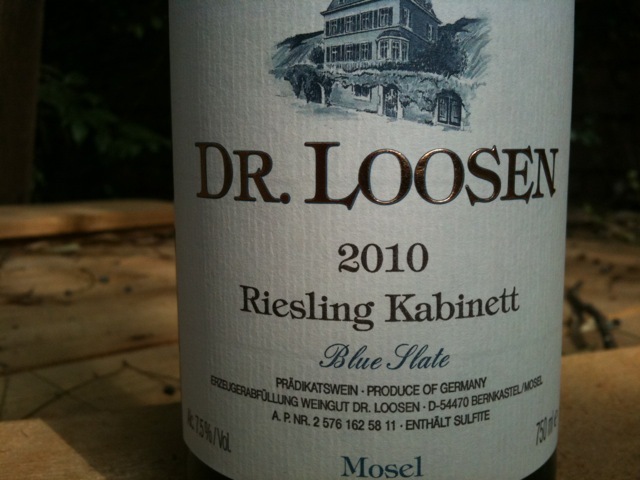 And, I hate to say it, but their entry level Dr. L Riesling, which can be had for $9 and up, would be my preferred choice, not just for QPR reasons. The Wine Spectator apparently awarded it 90 points and called it a “smart buy” (noting apple and citrus aromas, with kumquat in the the finish). It also received a Gold Medal at the Los Angeles Wine & Spirits Competition 2012.